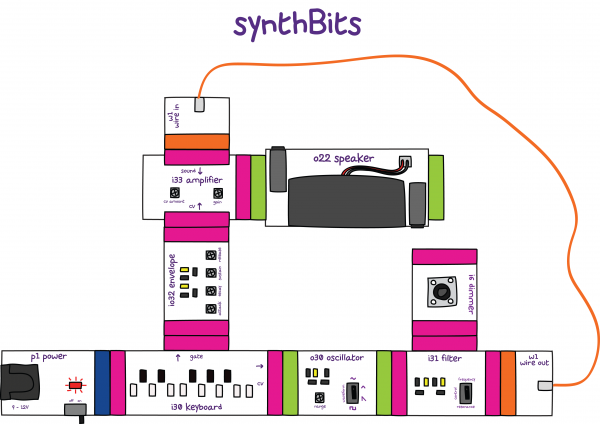 littleBits Synth Kit: Under the Hood « Adafruit Industries – Makers, hackers, artists, designers and engineers! Music, like making, is universal. No matter how far you travel, either in distance or time, you’ll find people creating, and whether it’s things or sound, the act of creating is a constant that connects us all. With that, we are extremely excited to announce the littleBits Synth Kit . Developed with Korg, the world-renowned electronic instrument company, we have successfully combined music and making to provide an experience that has never been seen before. Taking our goal of making an electronic design platform accessible for all, now anyone can dream up new sounds or songs and make them a reality as fast as their mind will allow. We think this could be the start of a new chapter in the history of music technology and we hope you’ll join us for the ride. Developed in partnership with Korg, a pioneer of electronic musical equipment, the littleBits Synth Kit is an infinitely customizable and expandable analog modular instrument. 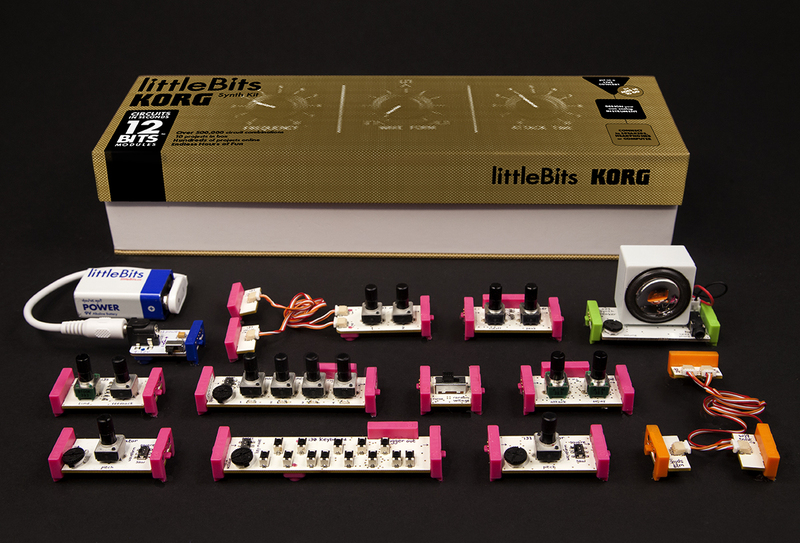 The littleBits Synth Kit includes an assortment of 12 electronic Bits modules that instantly snap together with magnets to create circuits like those used in Korg’s famous analog synthesizers (like the MS-20). The Synth Kit also includes a project booklet outlining step-by-step instructions for 10 projects. The Synth Kit was developed over the course of 9 months and is a collaboration between two seemingly different companies that share very similar ideals and principles. We embarked on creating a kit that would behave as a modular analog synthesizer but was accessible to anyone with an interest in sound. We started by ideating the different modules that might be possible and picked the ones that would offer the most complete and varied experience. 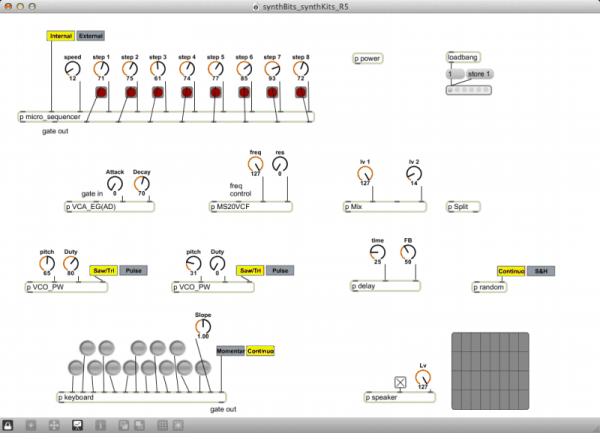 After several modules for the kit were selected, a MAX/MSP patch was created to simulate the behavior between them. This simulation informed a lot of the features and interactions the modules now possess. When thinking about the hardware layouts, the original sketches included trim pots for controls. This ensured the modules would remain small and there was no current precedent for a module to contain more than one potentiometer. After some reflection, it was realized that creating an instrument that required a screwdriver to adjust the controls would not be useful in a performance setting. We then decided to take the step to replace the trim pots with potentiometers, breaking a current convention but making the kit much more playable. Each module has a story behind how it came about. Find out more about how each module developed here.